Admittedly, my very first review of Freedom Munitions back in 2014 raised some questions for me. But over the last year or so, knowing that world class shooters like Janna Reeves, BJ Norris, and Jansen Jones shoot thousands and thousands of rounds of Freedom Munitions each year (presumably without issue, since they tend to do very well in matches) I began to think that it might be time to give Freedom another “shot.” So when Janna emailed me last year about the prospect of taking another look, I was all about it. Over the last few months, I have run almost 1000 rounds of Freedom Munitions 9mm through various pistols. The results have been great, and I plan to try out some other Freedom products when time and my wallet permit. Freedom has also improved its powder check system to allow for more accuracy, and newer QC protocols track and curb variances earlier in the process than ever before. In short, the Freedom Munitions crew set out to fix any issues they knew of or could prevent via manufacturing practices, and all evidence I have seen points to the fact that they have been pretty successful in their endeavor. Additionally, they changed up their approach to procurement, which should prevent any less-than-ideal powders being used in loads in the future due to a powder crisis (which we may well see in the coming months…yet again). But I digress; on to the ammo itself. I wanted to try exactly the same product that I had issues with a couple of years ago so that at least a portion of this review would be a direct, “apples-to-apples” comparison. The only substantive difference I noticed spec-wise was that the old 124 grain was loaded to an 1120 fps advertised velocity while both of the newer rounds (the standard RN load as well as the ProMatch one) appear to be spec’d at 1063 fps per the Freedom Munitions website. I received 500 rounds of the 124 grain new production round nose load and 500 of the 124 grain ProMatch 9mm (which was still going by the SuperMatch moniker when I received mine). Upon opening boxes of both the standard new production 124 grain 9mm and the ProMatch 9mm of the same weight, I was very impressed by the appearance of the rounds and the uniformity. And the lower velocity spec doesn’t bother me a bit; in fact—for match or training use—I prefer it because lighter charges mean faster splits. The comparison was telling by any rubric. Consistency-wise, the extreme spreads of 10-shot chronograph strings with the newer 124 grain ammo were barely more than half of the spread we saw in 2014. In 2014, the extreme spread over 10 shots fired was 62 feet per second. This time around, through a Glock 17, the extreme spread for the standard 124 grain RN was 37 fps; for the ProMatch the extreme spread was only 31. Through an XDm 5.25, the ES was a very comparable 32 fps. Neither the new 124 grain nor the ProMatch 124 grain loads exhibited any of the pressure signs or primer issues that we saw in our 2014 review, either. This was true whether we were shooting suppressed or unsuppressed and regardless of the type of handgun used. In short, the comparison was pretty easy. All of the new rounds we tested were excellent, as you can see in the photos and the table below. Although both the advertised velocities and the actual ones were essentially identical between the 124 grain RN and the ProMatch JHP, the ProMatch did seem to have a lighter felt recoil, but only negligibly so. It smelled like a different powder, so I would guess it’s something as simple as the burn characteristics of the ProMatch powder being slightly different. Both rounds were very consistent from a velocity standpoint—as you can see below—coming in just under their advertised velocities of 1063 fps through a Glock 17 and just over them through a Springfield XD-m 5.25. Though they clocked under the advertised velocity through the Glock, both rounds remained above the 125k power factor floor for various competitive shooting disciplines. Out of 1000 rounds I had only one failure, which was a light primer strike. Even if that was the fault of the ammo, it is an acceptable rate for training ammunition in my opinion. It happened in a match and I racked the slide to kick the round out. I may have lost 2 seconds. No harm, no foul—especially in a local match. 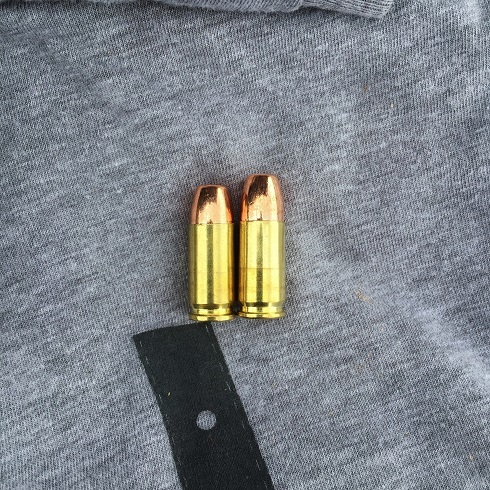 The only other QC-related issue I noticed out of these 1000 rounds was that one ProMatch round was set back in the casing a decent amount (shown, at left). Although the pressure of the ProMatch rounds is probably quite low in light of the fact that it’s meant for matches and it probably would not have been any issue at all if I decided to fire it, I set that round aside and chose not to. Again, we’re talking about 1000 rounds that were shipped a lot of miles via UPS. I don’t mind those odds for the price point. NO squibs, no double charges, and no pressure signs are a lot more important to me than having to toss one round because it was a little short. Accuracy-wise, this stuff did the job. I was shooting groups under 2″ at 10 and 15 yards off-hand without much trouble at all, so that was the extent of the dedicated testing I did for groups. The reason was simple: most ammo isn’t meant for bullseye shooters. And I’m not a bullseye shooter. So I shot this in the applications I would expect to use it: training and action pistol matches. And I can assure you, the reader, that none of my misses in drills or matches were because of the ammo. Whether I was shooting at 6″ steel plates, 8″ down-zero zones on IDPA targets, or anything else, when I had a solid sight picture I had no problem calling my shots with either of the rounds I was sent to test. –Colt Driver; photos by author. 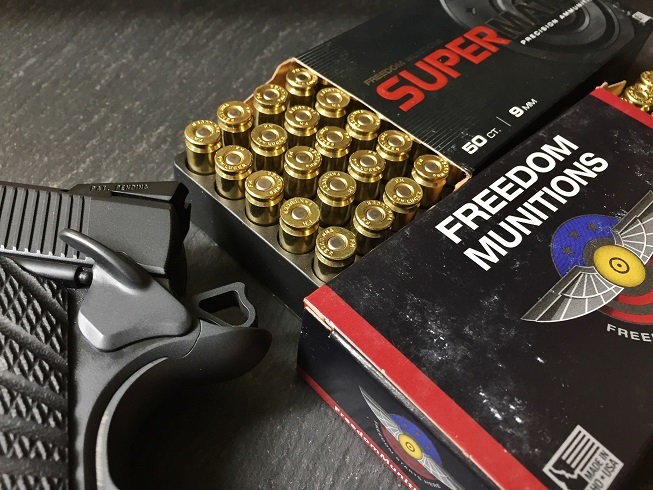 *Handgun Planet would like to thank Freedom Munitions for the ammunition sample we received for purposes of writing this review. 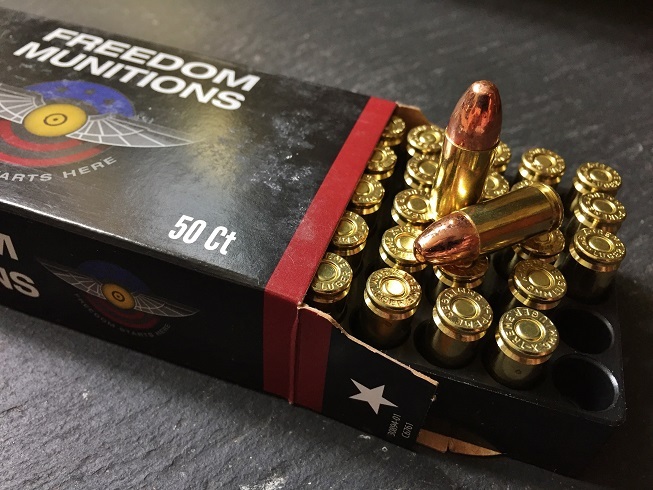 I started buying Freedom Munitions ammo last fall based on a friend’s recommendation. I and my friends that use it have no complaints. Can’t speak to changes over time, but certainly since last fall, I’ve had no problems with quality, timeliness of shipping, or price. I’ve seen a couple times when orders backed up, but they always give a heads-up on their Facebook page. Fortunately, this hasn’t impacted any of my orders, which have always come quickly; however, I appreciate (a) that business is so good that demand sometimes exceeds supply without driving the price up, and (b) that they give everyone a heads-up via social media when this happens. Thanks for the comment, Steve. 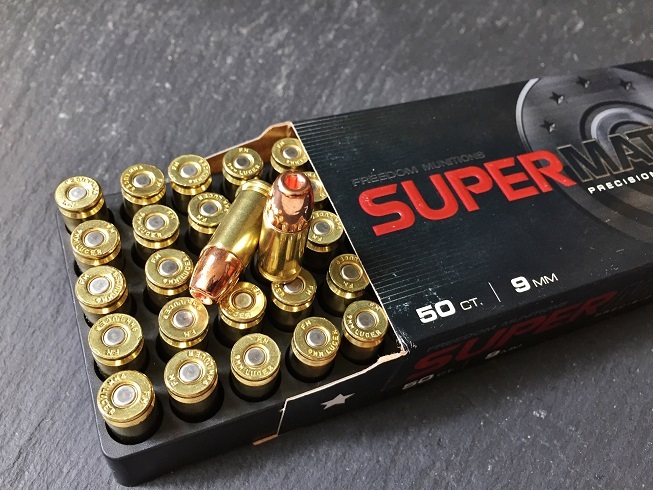 I have been impressed by the product recently and will certainly be using a lot more items from X-Treme Bullets and Freedom Munitions in the coming months!